La Bastide en Ardéche - Ardéche & Auvergne, France - Book now! La Bastide en Ardèche is located at the foot of Le Château de Sampzon, a 17th-centry grey-stoned building typical of the region. 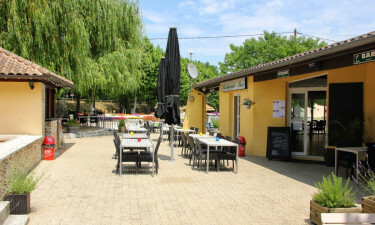 The main feature of this top class campsite is the large sandy beach on the banks of the Ardèche river. It's a perfect spot to launch a canoe, take a paddle, search for tiddlers and tuck into a family picnic. There is also a main swimming pool, kids’ pool, restaurant and bar at the site, as well as a recreation team organising family activities from May to September. 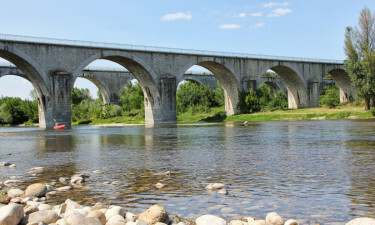 Have a look at the comfortable mobile homes available through LUX-camp, and start planning your relaxing holiday in France. What is there for my family at La Bastide en Ardèche? This 125 km waterway offers many activities both gentle and exhilarating. Hopping in a canoe and paddling down the stream is a popular thing to do from the luxury camping sites in this region. Fishing with a permit is a great way to spend a relaxing afternoon, or riding a bike in the countryside can be enjoyed by the whole family. Nearby, whitewater rafting can be booked for thrill seekers. 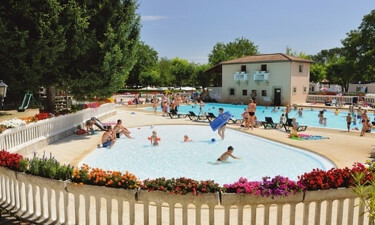 A luxury camping trip isn’t complete without time spent in a swimming pool, and there is a great one at this campsite. It is a large, square-shaped pool with a spacious toddler pool right beside it. A smart sunbathing deck surrounds the water with loungers and chairs dotted here and there. Just outside the pool area is a playground with a slide and swings. A recreation team organises a range of things to do all through the summer months. There is also tennis, table tennis, billiards, boules and canoeing on site. Nearby there is horse riding and quad biking on offer. For connecting to the internet, Wi-Fi is available for a charge from reception. There is a lovely onsite restaurant where tasty meals are served. The bar has an outside terrace which is perfect for an alfresco beer or glass of wine after the sun goes down. For lazy camping holiday evenings, pick up a takeaway from the fast-food service available. There is a camping shop where daily essentials can be purchased. Only 2km away there’s a large supermarket for stocking up on a larger scale. Not too far away, the picturesque town of Vallon Pont d’Arc has delicatessens, ice-cream salons, as well as a choice of places to eat.